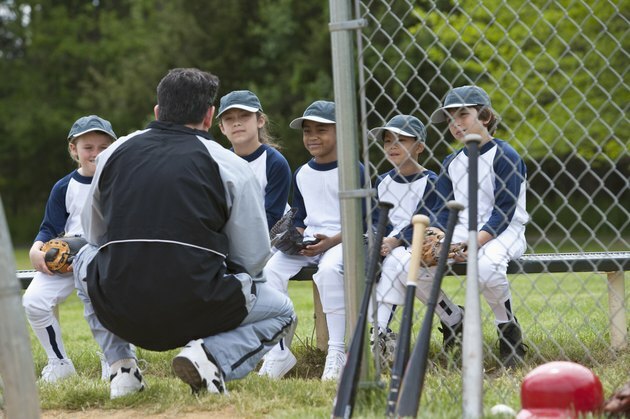 Teaching kids how to play baseball is a major responsibility. If they are playing in Little League or some form of organized baseball and you are coaching, you will have the opportunity to run practices and lead them in games. You want the young players to enjoy themselves while they learn the fundamentals of baseball. When you are coaching youngsters, it's best to make those fundamentals enjoyable if you want the players to stick with it and get the most out of their association with baseball. Try to associate fun with all your drills. It should not be like a lesson in school. For example, when teaching youngsters the proper way to field a ground ball, make sure they use two hands to field the grounder. Call it the alligator chomp. As the ball settles into the glove, have the throwing hand come down on top of the ball like an alligator closing its mouth. Once the alligator closes its mouth, nothing gets out of its mouth and once the fielder puts his other hand on the ball in the glove, it doesn't come out either. Teach kids the proper way to hit the ball. It's not just your arms that swing -- it's your entire body. Your legs have to lead the swing and your hips have to supply the power. These are complicated concepts for young players to understand, but you can get a young player to get his hips into his swing by telling him to "squish the bug" as he swings the bat. By twisting his left foot as he comes through the ball with his bat, he is swinging with his whole body. Teach throwing by getting players to throw overhand. Many players, even older ones, will throw at three-quarters or side arm. That's not what you want. Demonstrate the proper throw, with your hands straight over your head. As you show them, you can say "thumb to thigh, fingers to the sky." Scrape your thumb against your thigh as you bring your hand up in the air with your fingers reaching for the sky. Practice pitching by having your players involved in a game of knockout. In this game, all the players line up behind the pitcher's mound. Have the first player in line step to the pitcher's mound and have him throw a pitch. If it is a strike, he is safe. If it's a ball, he's on the hot seat. If the next pitcher throws a strike, the first player is out of the game. Keep going in this manner until one pitcher is left. That pitcher is the winner and will get the opportunity to pitch in the next game. Have water bottles available for each player; keep them well hydrated. Healthy snacks after practices puts the players on the right track for proper eating habits as they grow older. Keep practices short, with frequent rest and water breaks when the weather is hot to prevent heat exhaustion and heat stroke. Monitor the players to ensure that they aren't overextending themselves while they learn to play.